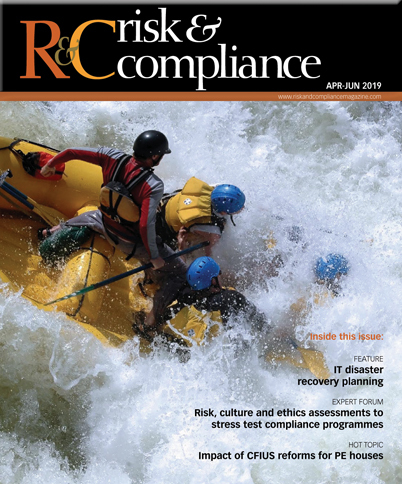 R&C: Could you provide an insight into how evolving data privacy regulations present challenges to companies? What have been the most notable developments in recent years? Turco: It is not news that data privacy regulations are changing rapidly. Many jurisdictions are passing new regulations and sometimes those regulations conflict. For multinational organisations, a mix of national data privacy and US state regulations creates a patchwork regulatory landscape that is difficult to manage. The most prominent development of late has clearly been the EU General Data Protection Regulation (GDPR), which effectively set the bar for personal data privacy. GDPR puts strict barriers around the use of personal data, which are only beginning to be tested in the courts. It is important to recognise the shift happening among the general population as a result of GDPR. The proliferating nature of high-profile data breaches among well known corporations, along with a string of revelations about use of personal data provided to social media platforms, has raised the importance of data privacy among the general public and has seen a groundswell of a new consumer activism. Amid this growing consumer discomfort about exchanging personal data with industry, consumers now feel, and are, empowered. The effects of this are significant and far-reaching, including your company’s brand and reputation being damaged, erosion of consumer and business partner confidence – all of which will significantly affect your bottom line.